Get ready for first grade and keep learning skills sharp all summer with this innovative activity-rich curriculum-based workbook. Organized week-by-week and aligned with state standards, kids will love the puzzles that make skills-practice fun plus the bonus pull-out Hidden Pictures progress poster, fun reward stickers, award certificate and the extra activities that they can take outdoors. Expertly crafted to combat "summer slide", The Big Fun Summer Learning Workbook (K&1) will give kids a head start on their upcoming school year. This book provides the right balance of review to keep skills sharp and a preview of what's to come, and features a wealth of Fun with a Purpose® puzzle-based activities. The book also includes ideas for simple ways to extend the learning through fun outdoor activities. PLUS -- a bonus pull-out progress poster, reward stickers, and a Certificate of Achievement! Highlights(TM) is the trusted brand that believes "children are the world's most important people(TM)." 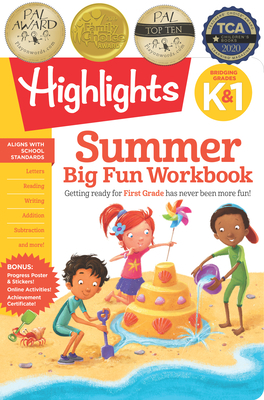 From our award-winning magazines--Highlights®, High Five(TM), and Hello(TM)--to our best-selling puzzle books and groundbreaking education books, the Highlights promise of helping children become their best selves can be found in all of our exceptional, high-quality products for children.